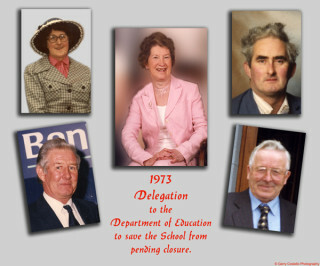 The parent delegation that met with Government officials in 1973 when the school was earmarked for closure and amalgamation. This was a great achievement for them at the time as there seemed to be little support for them from the then school manager and board chair who seemed to favour the closure of Garbally and it's amalgamation with an even smaller school with less potential for expansion and road access in Ballinruane. Pupils, teachers and parents gathered at Garbally National School this week for the official opening of their newly-extended school building at which Archbishop Michael Neary blessed the new facility. The children took ownership of their new building at the start of the new school year but this week the community gathered to celebrate the dawn of a new era of education at the 72-pupil school. 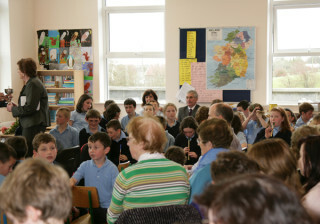 Maura Finnerty, who has been principal of the school for 39 years, handed over the reins in the days following the celebrations, which are a lasting legacy to her tenure in Skehana. Carmel Hoade, who has been a teacher at the school for almost 20 years, takes over as principal while the school welcomes a new teacher, Katherine Donnellan from Moylough, who will take over teaching duties for fourth, fifth and sixth classes. “We were very lucky in that a local contractor Pat Loftus carried out the work and did a superb job, along with the engineer PJ Newell whose skill and design have delivered our fantastic new school,” she said. 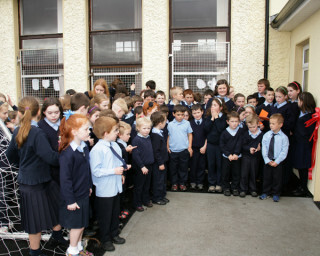 “The first hedge school was located at the back of the church, which gave way to the old school building that is now the community centre in 1881, before the current building was built in 1952. “We are appealing to the politicians, some of whom are here today, to help us clear the outstanding debt on the work that has been carried out as there are ambitious plans to further develop the school over the coming years. Father John O’Gorman, Menlough PP, said he had asked the children what they thought retiring meant and they had answered having fun. “Now that you have played such a key role in making today happen you can look forward to having fun, which is what you so richly deserve,” he told Mrs Finnerty. “We thought this day would never happen but now that it has we give thanks to God for making the sun shine on our day of celebration. A selection of hymns were sung by the school choir while prayers of the faithful and readings were read by the teaching staff, pupils and representatives of the Board of Management and Parents’ Association. 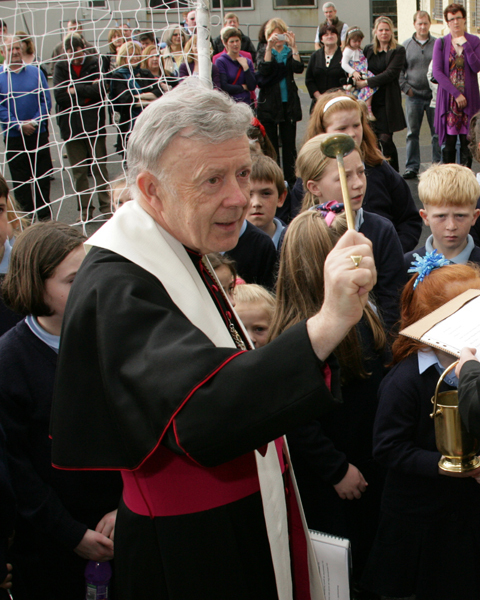 Archbishop Neary then performed the official opening by cutting the ribbon on the doors to the new extension, before blessing both the pupils and teachers and each room in the new-look school. 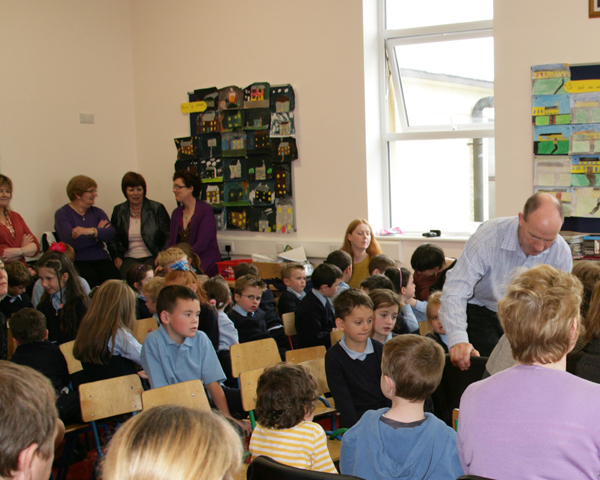 The infants’ room at the school also received a special blessing as it was dedicated to the memory of a former pupil, Myles McDonagh, who was tragically killed in a road traffic accident outside the school five years ago. A specially commissioned stained-glass window adorns the classroom door, featuring a young boy at the seaside, with colours and flowers that Myles loved.